During the Angevin rule, the island of Sicily was ruled separately by the Aragonese, who subsequently took over the mainland portion, giving rise to the name "The Kingdom of the Two Sicilies" (see 1282 & 1442, below). 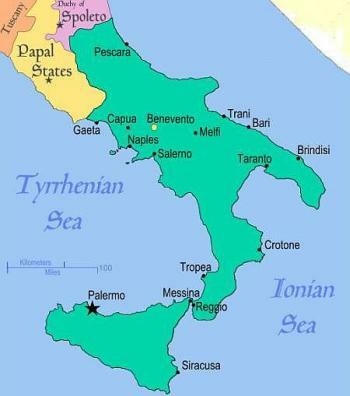 The Duchy of Benevento (the yellow dot on the map) was a separate Papal holding from 1053 until the unification of Italy. 5. The HAPSBURGS From 1503 to 1700, the Kingdom was a Spanish vice-realm with a long succession of viceroys appointed by the Spanish Hapsburgs. That dynasty is represented on the façade of the Royal Place in Naples by a statue of Charles V of Spain, who was crowned Holy Roman Emperor in 1520. In 1700, the Wars of the Spanish Succession broke out and lasted until 1713. 6. The AUSTRIAN VICE-REALM. From 1713 to 1734, viceroys of Naples were appointed from Vienna by the Austrian Hapsburgs. Naples again became a Kingdom of its own in 1734 under the Bourbon dynasty. 1266—King Manfred defeated by the armies of the Pope and Charles of Anjou; Charles becomes King. Naples becomes capital. 1861—End of the Kingdom of the Two Sicilies. Unification of Italy.